Ask fellow campers about "Echo Bay - Lake Mead National Recreation Area" and nearby attractions. Stayed nearly a month. A pet friendly park with lots of desert areas to walk your dogs. Nice quiet RV park, Mostly retired folks with boats. Spaces wide enough for truck and boats, picnic tables. Lots of empty spaces during Jan and Feb. Restrooms and showers warm and clean. Motel and restaurant closed but marina store open with limited supplies. Found Linn's grocery store in Overton, NV about twenty miles for good meats and produce. Marina dominates this resort, no public lake use area, no beach for families and children, no swim area, no fishing in Marina. Marina putting in new low water road and ramp. Lake is down some seven years now and affecting this resort. Overton Bay marina and park area closed, no water. We found shoreline fishing off Stewarts road, some five miles from Echo Bay,recommended four wheel drive. Caught a nice stripper but only one fish in many days. Boaters also not catching fish. Saw some wildlife: desert big horn sheep, birds, lizards, burros and enjoyed hiking the area. Friendly Lake Mead park Rangers. Probably camp here again, monthly rates, no discounts. We camped at Echo Bay - Lake Mead National Recreation Area in a Travel Trailer. We rented a RV site at this park for the entire summer from 2004-2009. 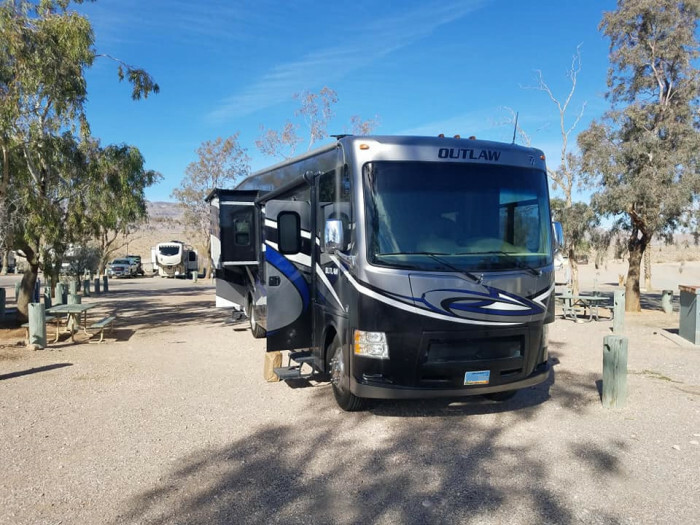 We lived in California and would leave our motorhome there all hooked up and ready to go. The spaces are large, we had a 30' motorhome, a full size truck and a 26' boat and still had room for another vehicle. Campground is clean, restrooms and showers are clean. Would highly recommend it. We no longer go because we have moved too far away! But our extended family still goes & leaves their RV's there all summer! 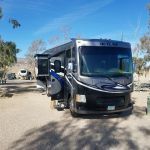 We camped at Echo Bay - Lake Mead National Recreation Area in a Motorhome. OK spot for one overnight. We wanted into Valley of Fire, however, due to Easter vacation was full. Went thru alot of road construction to get there. Some trees and level sites. Not our destination, however, OK for a backup. 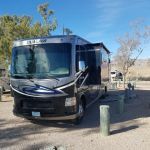 We camped at Echo Bay - Lake Mead National Recreation Area in a Motorhome. No complaints. The permanents that another poster mentioned are still there but the sites are no longer cluttered/messy. We would stay again. We camped at Echo Bay - Lake Mead National Recreation Area in a Travel Trailer. We came here because the Park Service closed Overton Beach. Echo Bay is a little more isolated than Overton Beach, but there is a little grocery store and gas station if you don't want to go all the way in to Overton or Las Vegas. During the winter months, the campground is close to full, with long-timers wintering there from Nevada, Utah, and Idaho. If you're there Thanksgiving or Christmas, make sure you join in on the potluck. The restrooms were very clean; the grounds of the campground are well-maintained. We had excellent satellite TV reception, and there IS a WiFi hotspot over at the hotel office. (I don't know if there's a fee or not; I didn't use it.) The lake is extremely low, but you can still launch boats at the marina. We caught dozens of strippers really close the marina; didn't even have to go out on the lake much at all. We camped at Echo Bay - Lake Mead National Recreation Area in a Travel Trailer. Seven Crown Resorts operates the rv park at Echo Bay Resort on Lake Mead. It is used primarily by "employees" and most of the sites look like the residents are permanent. It is not well maintained and there is a lot of "stuff" stored around the sites. Check in is at the hotel which is not in a big rig friendly area. The campgrounds (no hookups) which are run by the NPS look nice. Lake Mead cannot even be seen from the rv park. It is convenient for visiting the Valley of Fire State Park. We only stayed one night and would not stay here again. 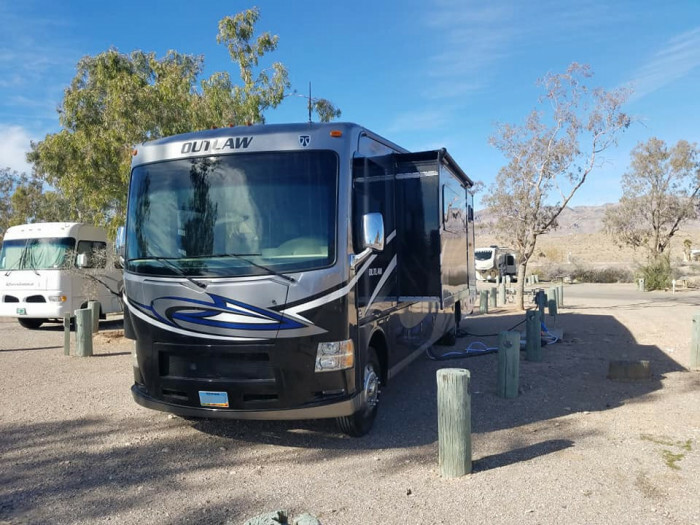 We camped at Echo Bay - Lake Mead National Recreation Area in a Fifth Wheel. Are you affiliated with Echo Bay - Lake Mead National Recreation Area ?